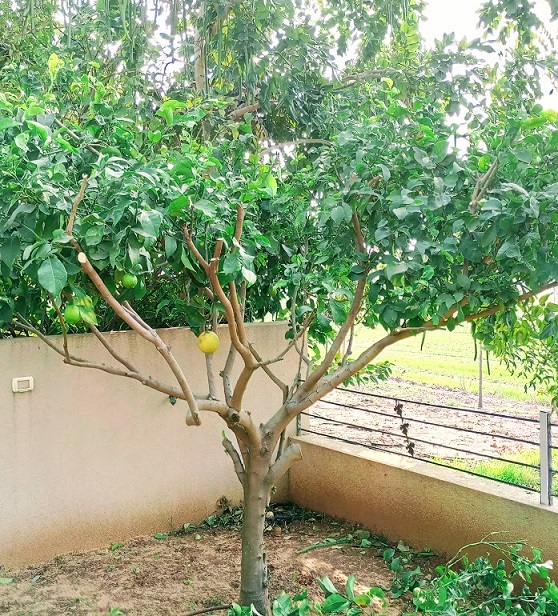 How to prune lemon trees? 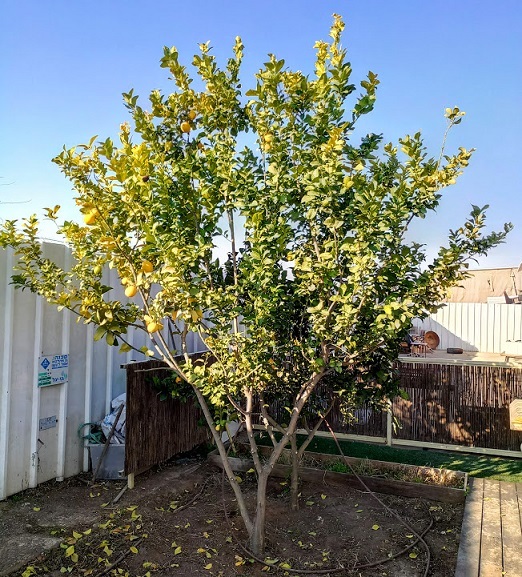 Pruning lemon trees – I tend to think of lemon trees as small children. I make that comparison because they are always searching for ways to grow and expand – they want to ‘spread their wings’. Although I love that about them, I see it as my job to teach them about rules and borders. 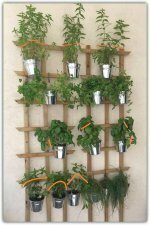 Lemon trees will always strive to grow straight up, it allows them to reduce the number of fruits and leaves they produce. For them, it's all about conserving energy, and then having enough to put into the fruit they do produce. Now that I think about it, they could be onto something… perhaps we have something to learn from them? But I digress… Back to pruning. 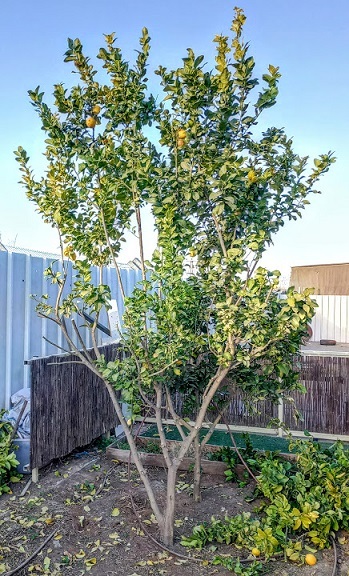 So, with a little guidance and a little pruning, you'll allow your lemon tree to maintain most of the energy where it should be – right at your height! Word of warning, while pruning lemon trees please make sure to wear your working gloves. Pruning lemon trees will bring you face to face with their long sharp thorny stems and shoots. 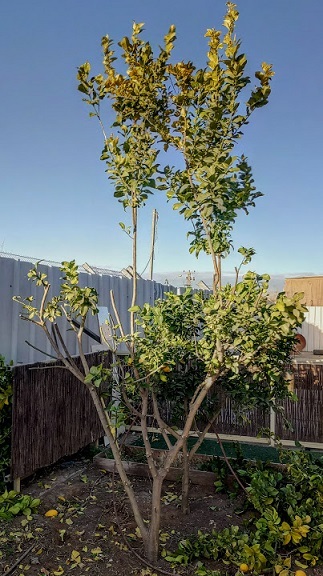 Why does my lemon tree need to be pruned? This is my lemon tree. Notice the density and the cross branches. You should also be able to recognize the long stems at the top of the tree, reaching out above the tree canopy (wasted energy). What you want to do here is clean things up a little, so that it serves both you, and the health of the tree. And healthy lemon trees provide lots of goodness, both in the form of lemons and in how much fun they are to prune! When to prune? 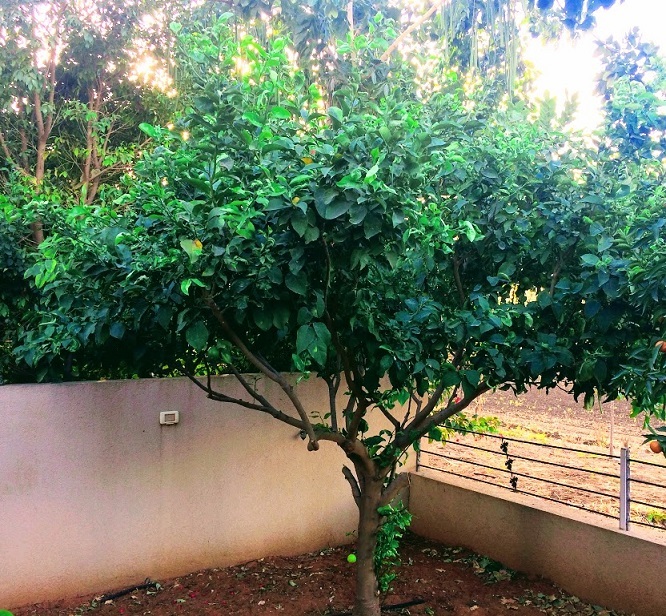 A lemon tree in a home garden will often yield two or three times a year. Unlike orange trees or clementine trees, with lemons the "when" is a little tricky. 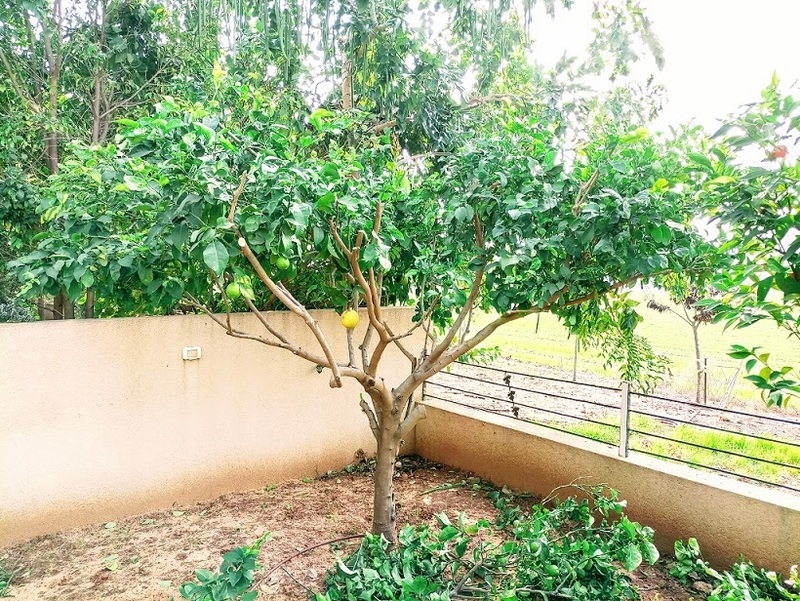 What I mean is that you need to plan – lemon trees should to be pruned soon after the last fruit cycle. 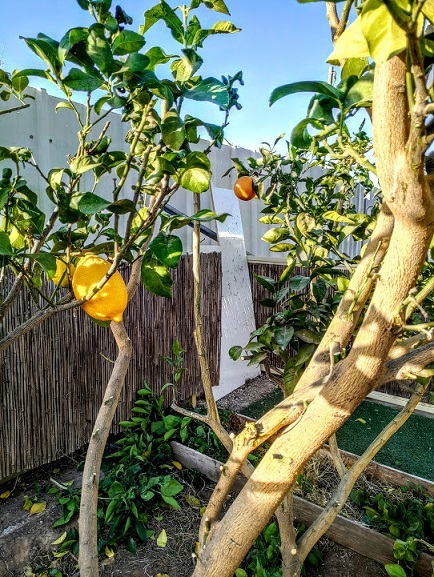 One important tip regarding the 'when' of pruning lemon trees - try to avoid pruning your lemon trees during the winter cycle. Although you can prune citrus trees throughout the year, warmer weather is always better. Where to start? As is the case with all citrus trees, when you decide you want to start pruning lemon trees the first thing you do is create a path, yes that's right, a path – you need to prune your way inside the tree so as to get a better view from the inside out. Where exactly? I usually begin on the north side of the tree, because as you prune you’ll be creating a hole through the tree, and if that hole is pointing north it will allow fresh air to circulate better, and more light to penetrate. But, the stems of citrus trees don't like too many hours of direct sunlight (did I say they were like children? more like teenagers really), so avoid making your path into the tree’s center from the south. The north will feel nicer to your tree. O.K. then, now that you have made a path and can easily get up close to the tree’s center, let’s move on to the next pruning stage. Remove a few branches with one hand and search for those long thorny stems and shoots, some of them will have developed quite well during the season and will have grown high above the tree’s canopy. Find one such branch and follow it down the stem until you find where they it shoots off the main stem or trunk - cut as close as you can to the main stem. Once you’ve made the cut, simply pull the branch out. Moving right along - next to be pruned are the dead branches, twigs and shoots. They can be pruned and removed whenever you see them. You will see things begin to become clearer and cleaner. You will now start to notice new leading stems, which were hidden from sight only seconds ago – that’s fantastic, you’re well on your way to a happy fruity lemon tree and to becoming an expert at pruning lemon trees – and take it from me, that’s no small feat. What else needs pruning? Well that's obvious. As you will always hear me say, pay attention to the height. 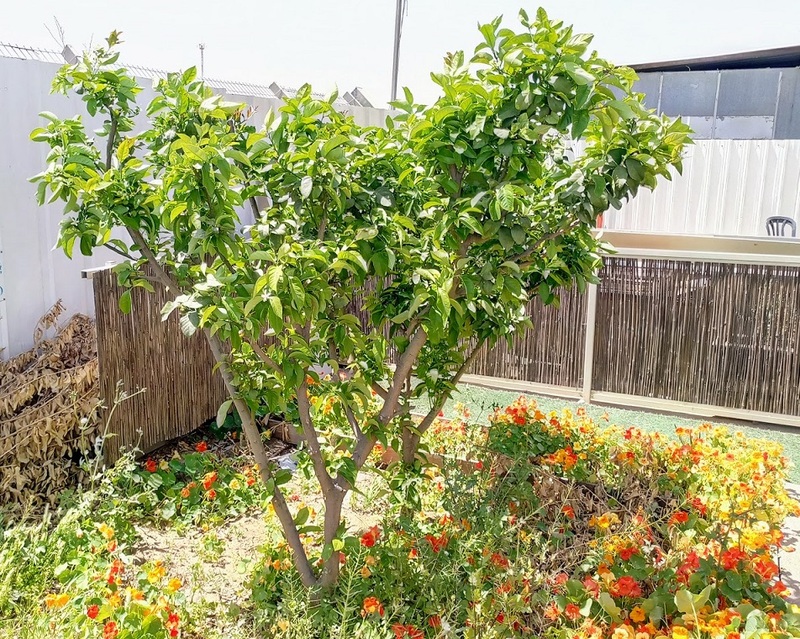 Keep the tree’s general height at your general height - it will help you train and care for your tree easily and picking fruit will also be easier and more fun. When pruning the top of the tree, there is no right or wrong place to cut. Trust your instincts and go with what feels good to you, you can always adjust it next season. The only thing is, be sure not to prune when your tree is in bloom as you will lose future fruit growth. My preferred pruning shears - As citruses are sometimes tough to prune (even the small dried twigs can give you a hard time) I suggest using bypass loppers. 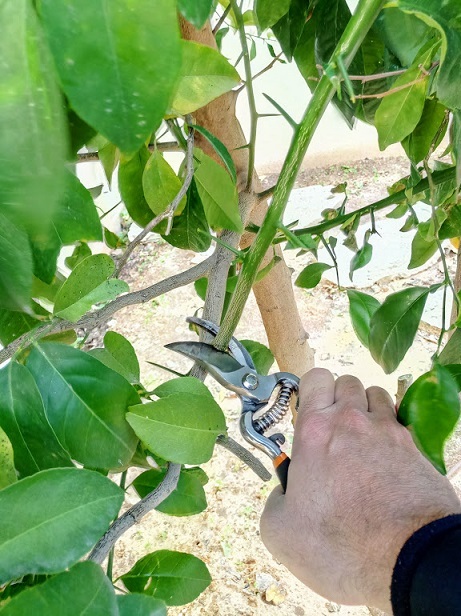 This is one of the funniest lemon tree pruning missions I’ve had, and I thought it would be a great chance to show you another pruning method (this time something a little harder and more advanced). A neighbor called me the other day asking me to take a look at his lemon tree. The moment I saw it, my first thought was to call the Guinness book of world records and apply for the title of ‘world’s tallest lemon tree’!! And believe me, I was in with a fair chance of winning. Now, I’m a tall guy, I’m not easily intimidated by height, but this was truly out of the ordinary. But, besides being tall, I am also one of those ‘always be prepared guys’, so I went right back to my car and got my emergency loppers, which I keep on hand for exactly these types of situations. Yes, this was a job for the loppers. 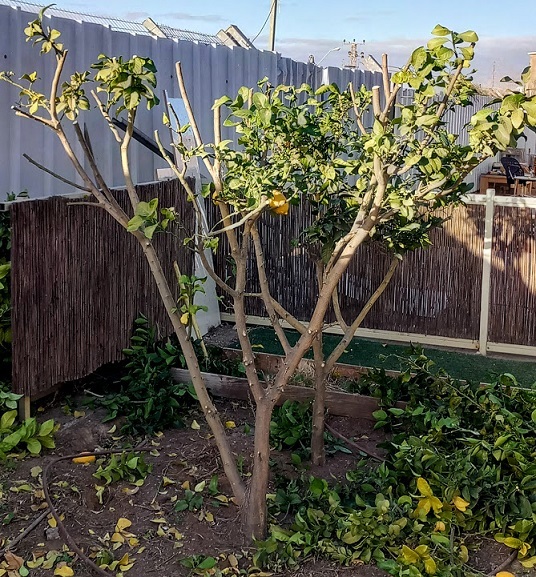 If you have already read my lemon tree pruning guidelines, just follow the pictures here and I’ll explain what I did in this somewhat strange case. See, when I say tall I really mean it! And I loved the cup shape, but hey, who can reach the fruits at this height? And how tall will it grow next year? It was definitely time for a change. The path to the tree’s center was clear, so I decided this time to prune from the outside – inwards. That way I would maintain eye contact with the tree’s natural structure (yes, I maintain eye contact. I also talk to them as I go). This approach also allowed me to see the falling branches (not so much fun when they fall on your head!). Also, see how I have ‘tightened’ the pruning "ring" around the tree. The final cut! Indeed, my lemon tree – rose bush look alike is ready for a life with new low-hanging fruit. A couple more things on the subject: Please don't forget to use a quality pruning sealer on stems wider than a finger (1/2 inch). this will reduce exposure to fungus and cold weather, and prevent heat burns. Also, painting the stems and main trunk with a special white color is a must to avoid over exposure to sunlight. Finally, I've saved a special surprise for you to the very end. It took me a few minutes to realize that I'm actually dealing with two citrus trees (!!). For some reason, the trees were planted only 25 inches apart. The challenge now is to keep the two trees - lemon and orange - together, healthy, happy and fruitful.